Konica Minolta, yes all future digital cameras are going to be presented under the brand Konica Minolta, is introducing their new camera at the PMA in Las Vegas. This new model is one of the smallest cameras in the world and has a really fast start-up time of just 1 second! The DiMAGE X21 is a typical digital camera from the famous X-series. It is ultra slim, has 2 Megapixels and a 3x optical zoom on board. Intuitive button location makes easy operation and a wide range of features like a mirror to check your own look before you take a self-portrait, Picture Composition, and Frame and Border give the user more ways to shoot and view pictures. The DiMAGE X21 is for people that are starting to think about entering the fun world of digital photography. 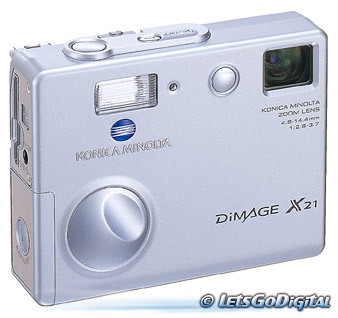 The DiMAGE X21 features Konica Minolta's non-extending zoom lens, maintains the cool outward appearance of the DiMAGE X21 even when the zoom is activated, this revolutionary design uses internal folded optics, which means that the slim profile of the camera doesnt have to change at all, even while recording. Even with 3x optical zoom, the camera is still just 24.5mm thick, whether carrying or shooting (21.5mm thick excluding the LCD monitor). Fast start-up: From the moment the camera is switched on, all you have to do is wait about 1 second and then you are ready to take great pictures. You'll never miss a moment of the action. Just turn the X21 on and start shooting away. Superbly Clear Images: The CxProcess II image processing technology incorporates characteristics like smooth gradations, natural skin tones, and brilliantly clear colours for images that are more natural and lifelike. The DiMAGE X21's 2 Megapixels capture fine lines and intricate details for stunning digital images. The slow shutter speed and Dark-Noise Reduction combine to prevent graininess and give exceptional night photos with clearly contrasted dark tones. XR Function: The XR (Extended Recording) Movie mode lets you record longer movie clips onto the SD memory card at resolutions of 160 X 120 or 320 X 240 pixels. Just keep on filming until the memory card is full. Easy and Convenient Operation: The DiMAGE X21 also incorporates a launcher type Graphic User Interface (GUI) menu system. The intuitive controls of the GUI mean that you get a user-friendly digital camera. Simply press the menu button for the user-friendly GUI icons that let you command all of the DiMAGE X21's settings. There are no complicated settings to be made or a thousand buttons to press. Direct Camera-to-Printer Printouts: The X21 can be connected directly to a PictBridge compliant printer. So direct printing from the camera is possible, you can check which image you want to print on the LCD monitor of the DiMAGE X21. More Functions for More Ways to Enjoy: The DiMAGE X21 allows you to see how pictures will turn out even before you take them, thanks to features such as Frame or Border, which adds a frame or border around the image, or Side by Side, which splices two pictures on each the left and right halves of the frame in the middle of the image. You can manipulate and play with your pictures to create unique images that will have people asking, "How did you do that?" Slide Show: Use the Slide Show function to play back images complete with dissolves, wipes, and fades so that there is no jumping from one picture to another. These digital images can be rotated to orient them correctly. Choose from Five Color Modes, Including Two Brand New Options: After taking your snapshot, it is possible to customize and personalize the images by choosing one of our five colour modes; colour, black & white, and sepia tones, posterization or the new Soft Focus option, which digitally simulates the soft filter effect of film cameras. Internal Memory for Recording Favourite Images: The DiMAGE X21 includes a Favourite Image function that allows you to carry your favourite images with you wherever you go. These precious pictures (about 10 VGA images) are saved onto an internal memory, which you can view time and again without the need to change or even use memory cards. The DiMAGE X21 uses a SD memory card or Multimedia Cards, letting you easily record and store your important data.